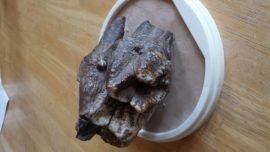 A mammoth tooth is on display at the Depot Museum. Did you know mammoths once lived in the Brodhead area? This awesome item was found in 1922 by Ervin Elmer when he was 5 years old, as he was playing along Searles Creek near his home in Sylvester Township, 7 miles southwest of Albany.